1. Our Voices Matter: Proposed Membership Plan Withdrawn. 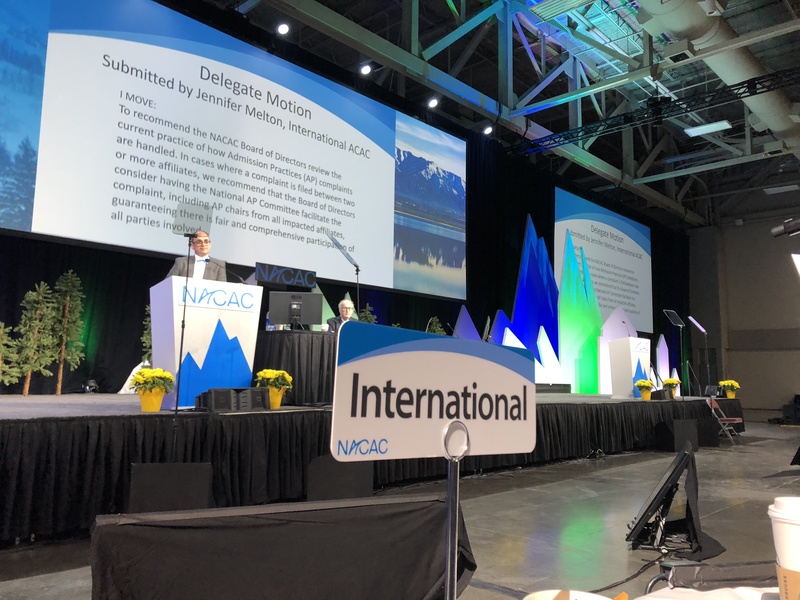 The proposed membership plan that NACAC Board & Staff had developed over past 16 months was sent back to the drawing board after it faced considerable pressure at the General Membership meeting. The amendments to the NACAC bylaws, that would have set the plan in motion, even after adjustments to individual counsellor & retiree categories in the days before and a delayed rollout to 2021, met numerous friendly amendments on the Membership floor. After nearly 90 minutes of debate on the floor, it became clear that there would be trouble with the numerous changes, and lengthy deliberation exposed the concerns many members felt about the process. 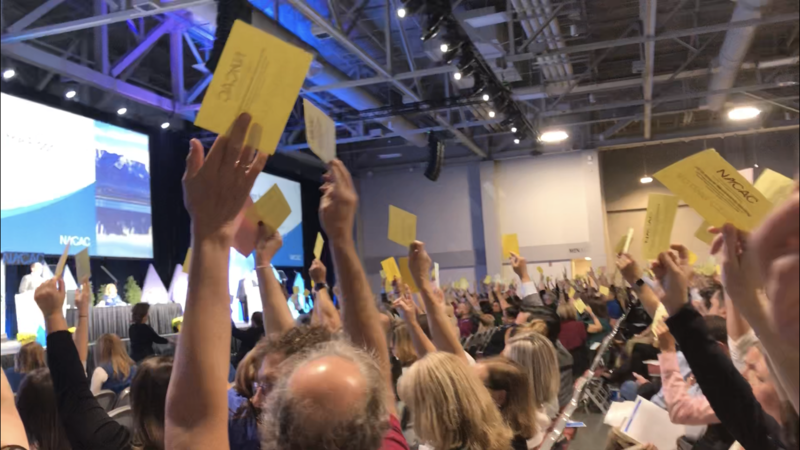 Finally, a NACAC Board member made a motion to withdraw the entire amendment… and that motion was nearly unanimously passed on the floor. Earlier on Saturday, your International ACAC delegates were very active during the five-hour Assembly Meeting. “The NACAC Assembly functions as a governing body that initiates, advises and provides consent on association and professional issues. Assembly delegates are elected for three-year terms by the NACAC voting members in the Affiliates.” It is during Assembly that the NACAC Board of directors and president is elected, and changes to the SPGP: CEPP are debated and voted. International ACAC made two formal motions. The first involves a request to NACAC to review the affiliate jurisdiction of the Admission Practices Procedure - to better allow a voice for our AP Committee team to represent our members in National AP cases. The second motion made was to form a NACAC Commission to review standardized testing access and barriers to International students. After considerable debate, which helped to draw the attention to both, particularly the testing access issues international students, both motions passed! 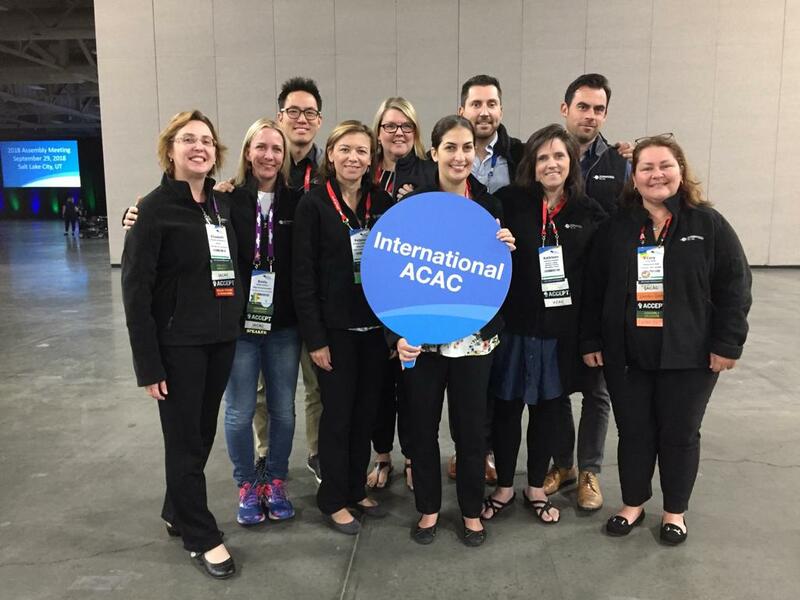 During the International ACAC Membership meeting the Association announced that we will be providing diversity training workshops in advance of the annual conference, free of charge to all members. The Executive Board, HQ staff, and committee members will be all required to participate. For those who cannot attend, and/or also want to engage throughout the year, we are researching an online training program. To fund this commitment, we have added $50,000 in the 2019 to cover costs of the program to ensure all members will have access. Those in attendance at the International ACAC Membership Meeting learned that the latest initiative of the Global Fund, Opportunity Grants, will be launched in October. It was announced that members would be able to apply for funding for projects and events for a total of $3,000 each. Funding requests will be made online through the Association website, and can cover anything from local student information events, bus programs for college fairs, or professional development requests. Overall this was one of the most powerful NACAC Conferences i have ever attended. Likely it had much to do with my position this time as a President of an affiliate, but in addition, it was something else that I know many others felt. It was the inspiring opening speech by NACAC President David Burge and the high quality of sessions (many focusing on student access and a growing number on international issues). It was the energy in our own membership meeting attended by well over 200, and above all it was the buzz throughout the week collectively knowing that we can make a difference, not only by having a voice in our own profession, but helping our students who will be the change for tomorrow. Yet I am reminded that many of our colleagues have never experienced the National Conference. So let’s continue to find ways to share our collective voice and power with one another. And as my fellow President Class friend and SACAC president Jessica Jaret Sant put it: “I’m inspired by so many of you who are as committed to supporting the new faces in our ranks as you are the kids you serve each day.” She put out a challenge for all of us to how we might serve and support one another better. Let us all take up that challenge, and focus on just being the best you can be to one another. I’m deeply grateful for the chance to represent International ACAC and am all the more committed in the continued work we will do together! Comments on "FIVE TAKE AWAYS FROM NACAC 2018"